In large bowl, beat butter and sugars until well combined. Add eggs one at a time, beating well after each. Add vanilla and stir. In medium bowl, mix together flour, xanthan gum, baking powder and soda, salt and cinnamon. Add to butter mixture and stir until well blended. Drop by spoonful onto a cookie sheet and flatten slightly. Bake for 14 minutes. 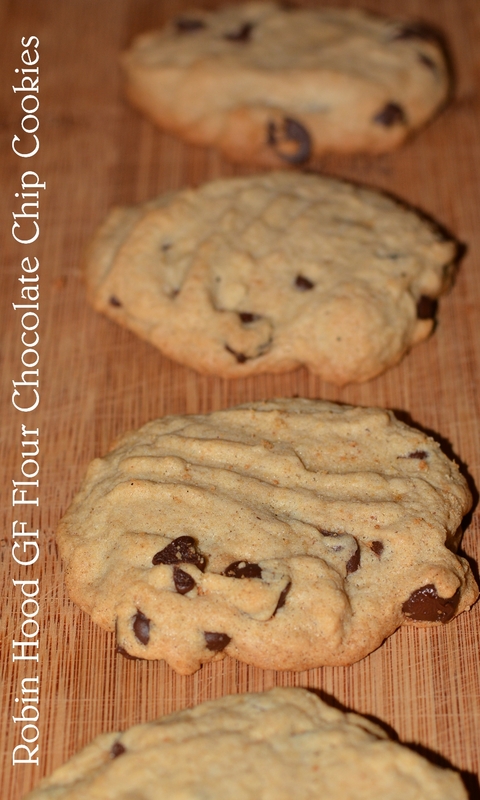 This entry was posted in Baking, Recipes and tagged chocolate chip cookies, GF, gluten free, gluten free in Red Deer, recipe, robin hood flour, robin hood nutri flour. Bookmark the permalink. I found the Robin Hood gf flour a bit grainy-feeling too, but the pricepoint is great and it’s very consistent across cookies, muffins, cupcakes, and crumble toppings. It’s easy to sub cup for cup too. I agree! Used the flour to make crusty bread tonight and it turned out pretty good too! Yeah, rice flour, always a bit grainy. Glad to hear they didn’t go stale for a couple of days. That’s my greatest difficulty. They go stale so fast? I know. Keeping gf items from going stale is a mystery – especially the breads!